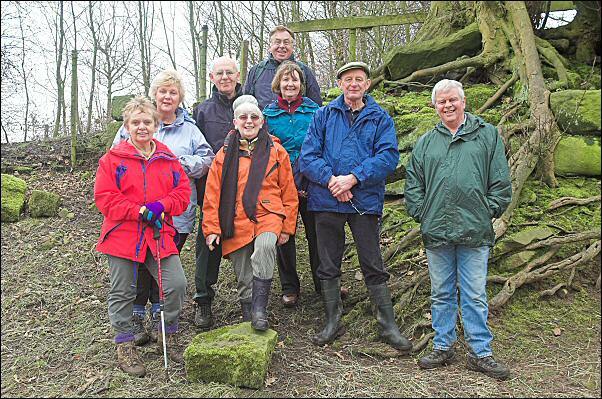 We pause by the old quarry at Ollerton Fold. A wide range of historical aspects were covered on the walk including the significance of water stop valves in the highway pavement to the line of the Thirlmere aqueduct. The weather was overcast and dry as we set off but by the time Ollerton Fold was reached the drizzle had started. Three tennon top gateposts almost all in a straight line set our imaginations off. An interesting descent via Whave’s Lane took us to the Leeds & Liverpool canal where we returned to Withnell Fold and the site of the old Paper Mill.